I hope you all had a Very Magical Christmas!! I sure did, it was filled with family time, good food and lots of great presents for everyone. Including few Disney presents and I wanted to share with you today. 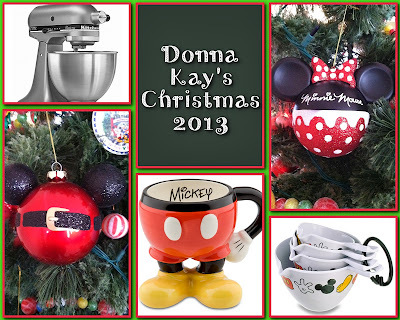 I have always wanted a KitchenAid mixer - and this was my year!! I cannot wait to test out some great Disney recipes and treats to share with you using my new baby. As a matter of fact I will start my Wilton Method Course 1 next week!! I am working on my skills so that I can create some cute Disney cakes & cupcakes to share with you in 2014. My new Mickey & Minnie ornaments are courtesy of Mike's friend Lewis who recently visited Walt Disney World. I love them!! I think they were the perfect new addition to our tree this year. A new Mickey mug to help me satisfy my hot chocolate addiction. Thanks Ashley!! Did you get any fun Disney stuff for Christmas? I would love to see it!! Share it in the comments below or on the Disney Donna Kay Facebook page. Thanks for letting me share my Disney addiction with you in 2013, expect even more in 2014. Donna, I have had a Kitchen Aid for over 17 years and I love it! It is one of the most used items in my kitchen, closely followed up by the same Mickey measuring cups you have! Great combination to make baking fun! I can't wait to see your creations from your Wilton course!